A few months ago I had the pleasure of photographing this fantastic tapestry for Special Collections of Manchester Metropolitan University. The original tapestry was commissioned in 1886 by John Prideaux Lightfoot, rector of Exeter College, Oxford, for the Gothic revival chapel built for the college in the 1850s by George Gilbert Scott. 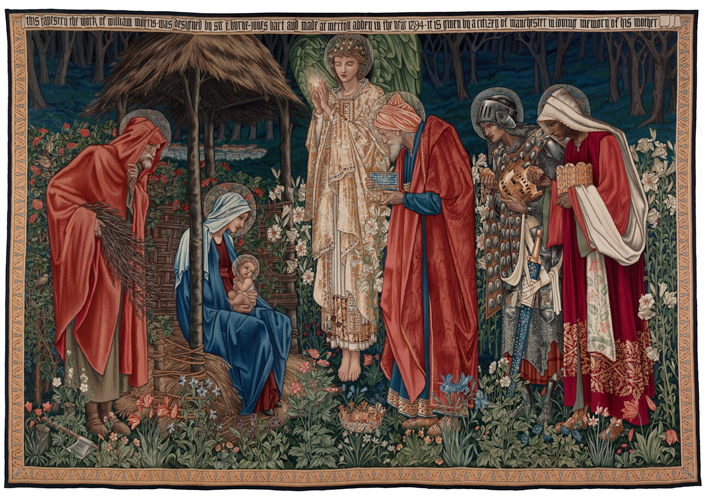 Lightfoot approached William Morris and Edward Burne-Jones, both former students at Exeter, and suggested the subject matter for the tapestry, to which Morris agreed readily in a letter to Lightfoot dated 4 September 1886. The overall composition and the figures were designed by Edward Burne-Jones, who completed a 26 × 38 inch modello or design in watercolour and bodycolour heightened with gold in 1887. 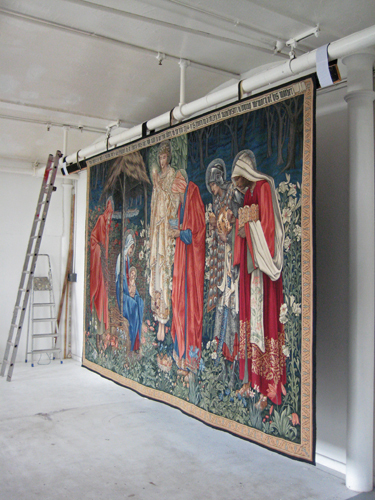 Large-scale cartoons for the tapestry weavers were created from photographically enlarged panels of Burne-Jones’s watercolour. In a letter of 7 September 1886, Morris had suggested that the tapestry’s colouration should be “both harmonious and powerful, so that it would not be overpowered” by the chapel’s brilliantly coloured stained glass. Morris and his assistant John Henry Dearle chose a vibrant colour scheme and added background and foreground details including the flowering plants characteristic of Dearle’s tapestry work. All in all, the tapestry took four years to realise, including two years’ work by three weavers at Morris’s Merton Abbey Mills. 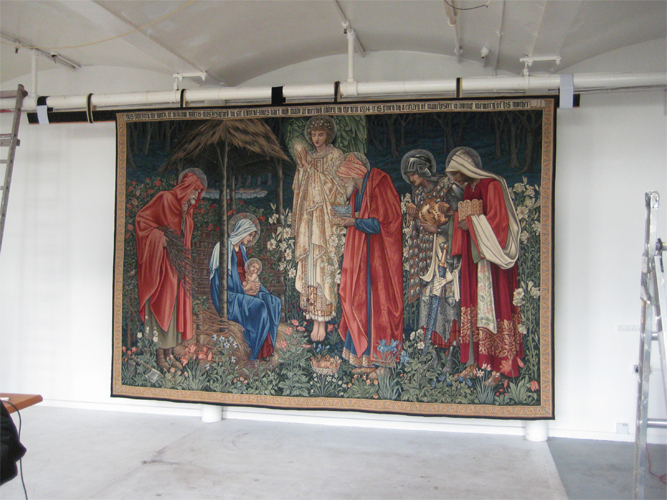 The tapestry was completed in February 1890 and displayed in Morris & Co.’s Oxford Street showroom in London that Easter before being presented to Exeter College.Lightfoot did not live to see the finished tapestry; he died at the Rectory at Exeter College on 23 March 1887. 1890 for Exeter College, Oxford, still in the chapel there. 1895 for the Eton College Chapel, still in situ. 1900 for the Museum für Kunst und Gewerbe Hamburg, still in situ. The original plan was to photograph the piece at the textile conservators studio. I visited prior to the shoot and the tapestry took up almost the whole of her studio. There was enough room for her to work but there was no way of getting it lit evenly with studio lights, let alone getting far enough back to get a full shot with a decent lens. After a few emails/calls and additions to insurance premiums it was decided the best option was to take it to my studio in Manchester and hang it there for shooting. It took four of us to hang this with the supervision of the textile conservator, it measures 2580 x 3840mm, and is surprisingly heavy. Needless to say we got some fantastic hi res shots and I also grabbed a few little digi-snaps of it in situ. I guess its not often you see one of these hanging in your workplace! It was taken down and returned the same day (unfortunately) ready for transportation to Japan where its now on display till the end of December 2012. Its not often that I post my other work related images on this blog as it tends to be for wet plate work but in this case I thought I’d make an exception as it truly was a sight to see. 17 Aug This entry was written by Fourtoes, posted on August 17, 2012 at 11:59 AM, filed under Misc..